Presdent Obama traveled to Newtown, CT tonight to address the small town of 27,000 and the nation at an interfaith vigil for the victims of Friday's tragedy at Sandy Hook Elementary. 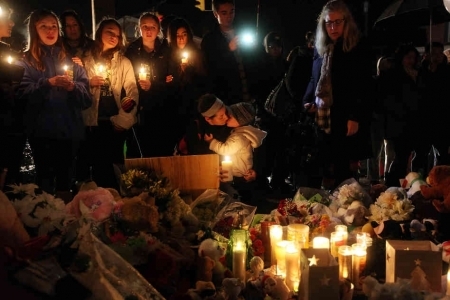 The Newtown High School auditorium overflowed into the gymnasium with parents and children of the community. "Caring for our children; it's our first job. If we don't get that right, we don't get anything right," said Obama. "That is how, as a society, we will be judged. And by that measure, can we truly say as a nation that we're meeting our obligations? Can we honestly say that we're doing enough to keep our children, all of them, safe from harm? ... The answer is no, we're not doing enough. And we'll have to change." The biggest question on everyone's mind is “Why?” It is something that investigators are still trying to piece together and may not ever really know. However, they do know that it could have been even worse. Lanza had a lot of ammunition left when he took his own life as police entered the school. The actions of the teachers in the school protected and hid the children. City Council has approved a bill granting a digital billboard on the Electric Factory building at 7th and Callowhill Streets. The vote in council was 16-1 in favor of the 7 story billboard on the building facade that faces I-676. Only Councilman Wilson Goode Jr. voted against it. There is some opposition from neighborhood groups claiming it would change the character of the neighborhood. However, the owner of the billboard promises that 25% of revenues will be put back into the local Home & School Associations at Spring Garden, Kearny and McCall elementary schools as well as other civic associations. Mayor Nutter is expected to veto the bill because he believes it's in an inappropriate spot and could jeopardize future state and federal highway funding due to the board's proximity to the Vine Street Expressway. Council will only need 12 votes to overturn the veto. This location was the topic of contention back around 2000 when the site owner erected an large scale unlicensed “wallscape” advertisement on the building. NJDOT is looking for snow plow drivers for the coming season. You must have a commercial license and a six-eight ton dump truck capable of carrying a snowplow or tailgate unit for salting. NJDOT will even train qualified drivers to snow plow. They are looking to augment their current fleet of trucks and drivers in the case of big storms. The “on call” jobs pay up to $43/hour. Résumés or qualification letters, along with a copy of their Class B CDL license can be mailed to NJDOT, P.O. Box 602, Trenton, N.J., 08625-0602.